We’d love your help. 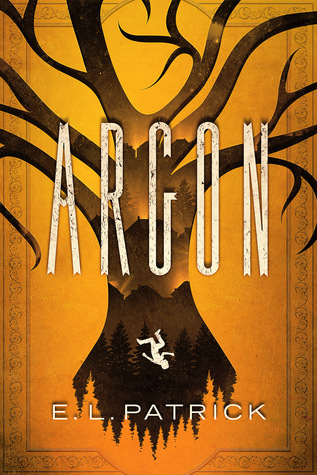 Let us know what’s wrong with this preview of Argon by E.L. Patrick. The first child vanishes early one evening, rocking the calm border town of Argon. Twelve-year-old Robbie Larsen watches his friend disappear but buries the haunting truth in a bid for acceptance. As the search stretches from hours into days, suspicion and fear cast some into a frenzy and turn the spotlight square on the newest citizens of Argon: the Larsens. When a second The first child vanishes early one evening, rocking the calm border town of Argon. Twelve-year-old Robbie Larsen watches his friend disappear but buries the haunting truth in a bid for acceptance. As the search stretches from hours into days, suspicion and fear cast some into a frenzy and turn the spotlight square on the newest citizens of Argon: the Larsens. When a second child disappears, Robbie discovers a dark secret that threatens to tear the town—and his family—apart. To ask other readers questions about Argon, please sign up. Argon, a quiet town on the Canadian border has new residents, the Larsens; Thomas, Mellie, Robbie and Bec. Whilst playing, Robbie's friend Jimmy vanishes before his eyes in mysterious circumstances. Of course, he blames himself, unaware of the real truth behind his disappearance. Bec is playing with her friend Roseli by the dyke, Robbie watches from afar, keeping an eye on his sister afraid she may vanish, however, Roseli's yellow rubber boot is found in the dirt not far from the back garden of t Argon, a quiet town on the Canadian border has new residents, the Larsens; Thomas, Mellie, Robbie and Bec. Bec is playing with her friend Roseli by the dyke, Robbie watches from afar, keeping an eye on his sister afraid she may vanish, however, Roseli's yellow rubber boot is found in the dirt not far from the back garden of the Larsens, and Roseli is missing. Fingers are pointed and eyes view the new family with suspicion, egged on by Walt Blackwell who decides to lead an assault on the Larsens home after more kids go missing. However, supernatural forces are at work and the town is plunged into turmoil with devastating consequences. This was one of those books that skips along at a good pace, pulls you in, and time vanishes. You will say just one more chapter then bed, but it does not happen. Whilst the first part of the book there are many characters to be introduced the latter half pulls them together. Not advisable reading if you have important things to do, like feed the kids, go to bed etc., because you just won't want to put it down until its finished. Great first novel. I am looking forward to the next book The Reappearing Man and the continuing saga. An impressive mystery thriller with a supernatural twist! This one kept me well and truly gripped and definitely gave me "just one more chapter" syndrome, I finished it in less than 24 hours. The story has plenty of twists and turns before coming to its inevitable and shocking end. I found it a little difficult to keep track of who is who at the beginning as the reader is introduced to a number of characters who are all interconnected and many of them have similar names or are known by multiple n An impressive mystery thriller with a supernatural twist! I found it a little difficult to keep track of who is who at the beginning as the reader is introduced to a number of characters who are all interconnected and many of them have similar names or are known by multiple names. Once I got to grips with everyone, I very much enjoyed the different characters. Some we very likable, others not so much (but in a good way!). The author wrote different ages very well as we read from the point of view of a number of characters of different ages and all were believable. With a dark supernatural thriller set in a small town, you can't help but compare it to the likes of Stephen King. There are many similarities of themes, disappearing children, the evil of a small town, the evil not only of the supernatural but more importantly, the evil of ordinary men and women. This is a theme I absolutely love and it is truly terrifying. This was a bizarre little book. It was pretty far outside my normal comfort zone of preferred reading material, but the synopsis sounded good, so I gave it a shot. Two missing children in a small Canadian border town spark fear and gossip. A mob mentality forms amongst the town against a family of newcomers. The Larsens have recently moved to Argon after many failed attempts to find a permanent place to settle. At first they seem to fit right in. The two children quickly make friends, and their p This was a bizarre little book. It was pretty far outside my normal comfort zone of preferred reading material, but the synopsis sounded good, so I gave it a shot. Two missing children in a small Canadian border town spark fear and gossip. A mob mentality forms amongst the town against a family of newcomers. The Larsens have recently moved to Argon after many failed attempts to find a permanent place to settle. At first they seem to fit right in. The two children quickly make friends, and their parents seem to be getting into a routine. Then the first child disappears. The WAY he disappeared is just...weird. You obviously know that something in the realm of sci-fi is going on with this book, but I had a hard time going along with it. My biggest issue with this book is how many people are in it. This is a fairly short book (under 200 pgs) and there were so many people and names thrown at me in the beginning that I really struggled with trying to remember which kid belong to which parent, what that parents role in the town was, and how they were connected to the Larsons. It was overwhelming. Overall, it was a decent short sci-fi. There's some paranormal going on here, and it really reminded me of a Stephen King novel...very Carrie-esq. Not sure I would recommend this to my friends as it would appeal only to a very specific type of audience, but it wasn't too bad. Don't think I'll be continuing on with the series though...it's just not for me. Don’t start this book if you have anything important to do soon. I mean, Jeepers. It’s a tense, breathless read. The horror of the story comes from the pettiness, and small town, suspicion, and casual cruelty and selfishness even before there are any fantastical happenings. Oh, that ending btw. There’s one single horrifying line that felt like I had been punched. Luckily a sequel is coming, and I’m very interested. ARGON is a tense, fast paced and dramatic read that gets the blood pumping and plucks at some heartstrings. Although the main appeal of this novel may be the supernatural themes and the thrilling elements of not exactly ‘whodunnit?’ but instead ‘whatdunnit?’, the real emotional core of this novel is the relationship between the Larsen family: son, Robbie; daughter, Bec; mother, Mellie; and father, Thomas. Having moved to the town of Argon on the Canadian border, the Larsens hope to put their trou ARGON is a tense, fast paced and dramatic read that gets the blood pumping and plucks at some heartstrings. Although the main appeal of this novel may be the supernatural themes and the thrilling elements of not exactly ‘whodunnit?’ but instead ‘whatdunnit?’, the real emotional core of this novel is the relationship between the Larsen family: son, Robbie; daughter, Bec; mother, Mellie; and father, Thomas. Having moved to the town of Argon on the Canadian border, the Larsens hope to put their troubled past behind them and settle down in this close, contained community. They are desperate, drained and determined that Argon will be the place where they establish some roots. Yet peace is not on the cards for the Larsens, when at the very beginning of this novel Robbie witnesses his friend Jimmy disappear under somewhat confusing circumstances. With suspicion surrounding the Larsens, Argon’s citizens increasingly questioning the circumstances of their hasty arrival, the flames of antagonism are fanned with the disappearance of a second child. Seizing his chance to gain political sway over this small town, arrogant wannabe-patriarch Walt Blackwell leads a witch hunt against Robbie Larsen which will have disastrous consequences for all involved. This novel was a real page turner, each chapter propelling the reader through a plot that is both straightforward, tangled and intricate. The relationship between Thomas and Robbie is the real anchor of this writing, however, where father and son stand together to face the condemnation cast against their family. But what is most intriguing about the plot of ARGON is that what you see on the surface is most definitely not the whole story, in both the everyday and preternatural sense. The Larsens are not completely blameless, and the depth of their involvement in these disappearances is different from what the reader may initially believe. The sense of claustrophobia in this setting is effectively executed. Not only physically, with the close copses of trees and the foreboding feeling of something unnatural lingering over the town, but also socially, with a small town mindset evoked through the Argon citizens constantly whispering, judging and gossiping about events they have no real insight into. Yet although ARGON has many strengths, it also has a number of faults. Which is why this novel has only be afforded 3 stars, due to the issues with pacing and structure in the latter half of this narrative. Indeed, the main issue is predominantly in the final scenes; whilst the build up and rising action is carefully plotted, with details revealed to the reader in a deliciously gradual unfurling, the climax in contrast seems rushed and underdeveloped. It was disappointing for crucial events to be skimmed over as they are, and although the conclusion is intended to close on a dramatic note, to some it may be considered too abrupt. Anticlimactic, if anything. E. L. Patrick is a fourth-generation Canadian whose ancestral origin is steeped in mystery. He writes about people restored and devastated by choices, and about who we are behind the masks. He lives in the heart of North America, in the majestic sprawl of God’s prairie, with his wife and children.